After Ceyx and Halcyone have been changed into kingfishers, Ovid has one last story of transformation into a bird, with which to conclude Book 11 of his Metamorphoses: that of Aesacus, who unwittingly led to the death of Hesperia. A man watching kingfishers fly together tells this story of one of the sons of Priam, king of Troy, thus a brother to Hector. While Hector’s mother was Hecuba, this brother, Aesacus, was secretly born of Alexiroe. Unlike his famous brother, Aesacus shunned Troy and populous places. He often pursued Hesperia, the daughter of the river-god Cebren, but one day as she was fleeing from him, she was bitten on her foot by a venomous snake. and hurled himself into the sea below. with feathers, as he swam among the waves. The death he sought for was not granted him. departure from the wretched pain of life. and takes his name from diving in the waves. This short story has not proved popular, and like those immediately before it, has hardly ever been painted. 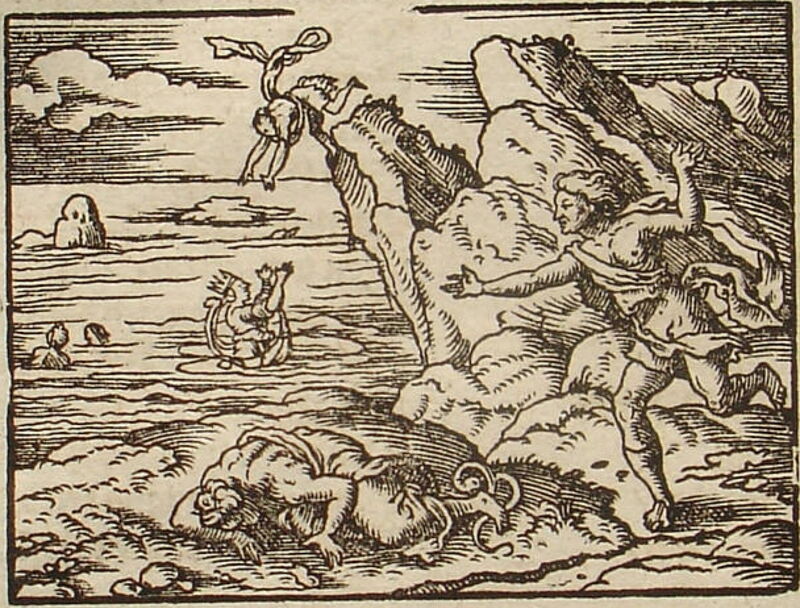 Virgil Solis (1514–1562), Aesacus and Hesperia (date not known), engraving in Ovid’s Metamorphoses, further details not known. Wikimedia Commons. It does have the benefit of a rather good engraving by Virgil Solis of Aesacus and Hesperia for sixteenth century editions of Ovid’s Metamorphoses. In the foreground, Aesacus has just caught up with the dead body of Hesperia, the offending snake still by her foot. Then behind them is the sight of Aesacus throwing himself from the top of a cliff, with Tethys ready to catch him below. Jules-Élie Delaunay (1828-1891), The death of the Nymph Hesperia (1859), oil, dimensions not known, Ny Carlsberg Glyptotek, Copenhagen, Denmark. Wikimedia Commons. The great nineteenth century narrative painter Jules-Élie Delaunay, a friend of Gustave Moreau’s, is probably the only painter to have depicted this story in a significant work: The Death of the Nymph Hesperia (1859). I apologise for the poor image quality, which does not show sufficient detail to determine whether the snake is still present. Hesperia lies, cold, white and dead, as Aesacus blames himself for the tragedy. At the top right corner are the overhanging cliffs from which Aesacus will shortly hurl himself, but there is, of course, no multiplex narrative here. 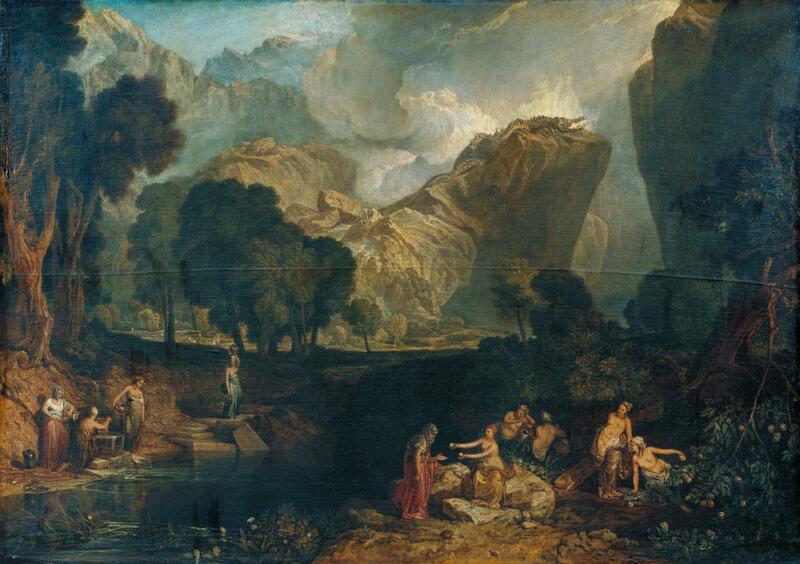 There is another painting which I think we should bear in mind: Ovid’s account is unique, and stresses that Hesperia is the daughter of a river-god, and not one of the Hesperides. Even so, I believe that there is some overlap (conscious or otherwise) with those daughters of Hesperus, the Evening Star, and their garden. For it was their garden which provided the golden apple of discord to the feast of the gods at the wedding of Peleus and Thetis, and thus set in train the events leading to the fall of Troy. JMW Turner’s The Goddess of Discord Choosing the Apple of Contention in the Garden of the Hesperides (1806) shows Eris, goddess of discord, as an older woman, dressed in a red skirt, in the centre foreground. She is choosing between two golden apples which have just been picked from the surrounding garden by the Hesperides shown. It may be that Ovid is not only telling this story here because Aesacus was Hector’s half-brother, but because of this association between Hesperia and the golden apple of discord. This brings us to the end of Book 11. The next book makes better progress in the story of the Trojan Wars, for which there should be no shortage of great paintings. If you’re having problems with keychains, or wish to keep an eye on them, you’ll want to know which tool to use. The short answer is that there are hardly any, although the situation isn’t quite as bad as that may sound. The essential tool is Keychain Access, one of macOS’s bundled tools kept in /Applications/Utilities. This gives access to all the visible private and system keychains on your startup volume, and gives you good control over them. It can be ponderous in use, such as when copying items from one keychain to another, and no longer offers any facility to check or repair a damaged keychain. That ability was removed from OS X 10.11.2 because of a major security vulnerability, and has not been restored since. If you cannot do what you need in Keychain Access, you may need to look at Apple’s bundled command tool security. This is a formidable collection of functions stuck together by using command verbs, such as list-keychains and unlock-keychain, and not for the faint-hearted. I have described some of its features in this article, but you will need to read its manual carefully using man security. security doesn’t offer all the features necessary for working with system keychains such as /Library/Keychains/System.keychain. That is the default target of the separate command systemkeychain, which creates system keychains, lets you use one keychain to unlock another, and more. As ever, man systemkeychain provides full details. security show-keychain-info ~/Library/Keychains/login.keychain-db which shows the current locking settings for the login keychain for the current user. None of those needs to be run as root. Few more generic tools offer much for keychains. Even the otherwise comprehensive EtreCheck doesn’t currently attempt to identify which keychains are in use, or which is the default user keychain, and these details are omitted from Apple’s System Information too. Those wanting forensic analysis should look at the Windows app Password Digger, from Elcomsoft, a commercial product costing around €200. For keychains in El Capitan and earlier, the open source chainbreaker might be useful, but doesn’t appear to have kept pace with Sierra and later. which you can pipe into a file for further assessment. It is extremely simple to do the same thing in Consolation. Open a new window, and set the Filter to use a pattern consisting of eventMessage CONTAINS[c] keychain, for a period such as the last hour. You can also browse those entries when you Command-click on a chart bar in Woodpile: simply turn on a custom style for the log, tick the All log entries box, and enter the word keychain as a filter. When you next Command-click on a bar to view log entries for the period set by that bar, you’ll be shown all the messages containing the text keychain. As I pointed out yesterday, though, using log excerpts will only be useful when running macOS Sierra. High Sierra, at least versions 10.13 and 10.13.1, doesn’t keep useful log records of keychain access. One major feature which is largely ignored by all the above is the use of iCloud keychains: all are primarily intended for use with local keychains, and none (for example) provides any facility to make a copy or backup of a keychain held in iCloud. As keychains are the most important items held in iCloud which are not backed up there, this is a significant omission. You can make a manual backup, as detailed here. Some time ago, I started work on a second version of KeychainCheck which uses direct calls to macOS rather than working through command tools, which opens up some more powerful features. I abandoned this largely because the interfaces to macOS calls had not been ported to Swift, and using them was tedious. As there isn’t anything available which will help those with keychain problems beyond the features of Keychain Access, I have started to dust off that project and have already ported it to Swift 4.0 in Xcode 9.1. If you know of any other useful tools for working with keychains in Sierra and later, please let me know.